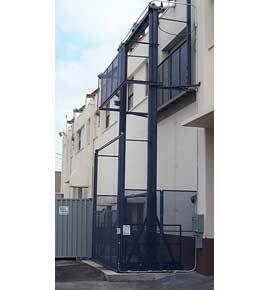 Series M Lift Offers High Performance And Durability With A Proven 2-Post Mechanical Design. Designed to transport large, heavy loads between two or more levels. Ideal for high-cycle, automated systems or frequent-use applications. Lifts up to 8,000 lb. loads with carriage sizes up to 10' x 12'. Vertical rise to 200'. Travel speeds up to 400 fpm. Carriage is lifted and lowered by heavy roller chain attached to a mechanical lifting mechanism. Offered with straddle or cantilever carriages.